I have NEVER posted TWICE in the same day before, so you MUST know that this is gonna be good! 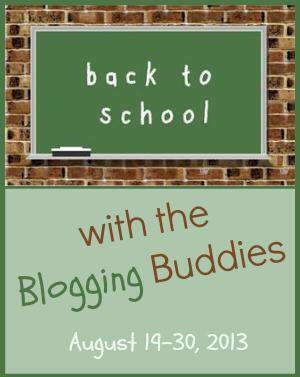 I’m so excited to announce that, starting on Monday, I will be participating in a blog hop called “Back to School with the Blogging Buddies!” (A blog hop, in case you’re not familiar with the term, is a “series” of blogs shared on specific days from a group of bloggers.) Yep, it’s Back to School time, and 8 fantastic ladies have been working on posts to help YOU get off to a great start this year! Each of us will focus in on a special topic regarding going back to school! I promise, you don’t want to miss this! So, just WHO are these lovely bloggers? And I guess you probably want to know what we’re talking about, right? August 22 – Back to school Organizing (Kristen @ The Road to Domestication) <— There I am again! You can see that we’ve got some awesome stuff goin’ on, and we can’t wait to share it with YOU! Hey, we’ve already been working hard – check out our special Back to School Pinterest Board HERE and follow along – we’re not done pinning! So make sure you check in here every day for two weeks, starting on Monday! (Or just bookmark this page and come back to it!) I’ll make sure I note on my daily blog posts who you should “hop” over and see, or you can open your bookmarked link and check the schedule. Are you ready?! It’s gonna be good! This entry was posted in Organization, Social Media and tagged Back to School, Homeschooling, School, Virtual Schooling. Bookmark the permalink. Sounds like fun! I will be stopping by to check it out! And Kristen, you are the one writing on organizing. Why am I not surprised, will be good! Ohhhh!! What a great blog hop! I’ll be tuning in every day! I need lots of help to get ready for school again. Have fun with it!!! This is a fun idea and it looks like you will have info that we can actually use! I’ll let my readers know that this is going on!